The next talk by the Yale Science Diplomats features a talk about Evolution. Earth is home to a startling variety of life, from giant whales to tiny insects. But how did such a variety of life come about, and how did life change over time? The theory of evolution attempts to answer these questions, but evolution is not as simple as we once thought. Scientists can look at the Flesh of a bird and how it uses wings to fly, look at its Blood and determine how its genes have created the wing itself, and look at the Bones of its ancestors to determine how birds even learned to fly. 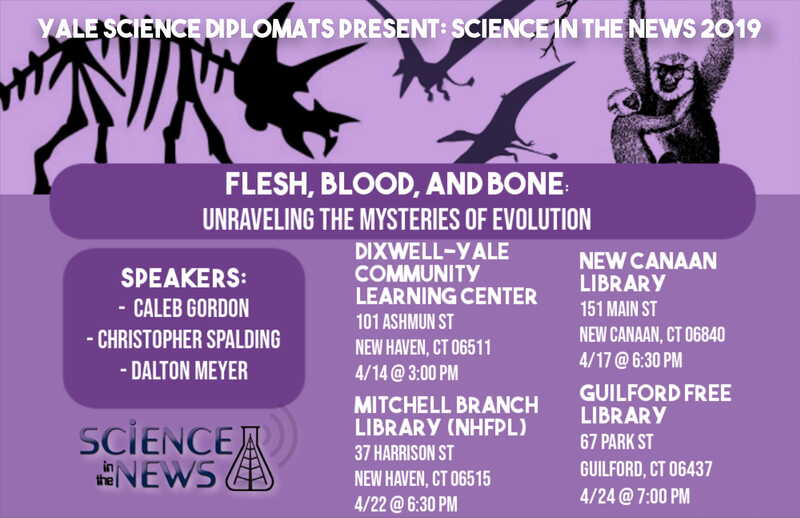 This installment of Science in the News will describe the various answers to the question “What is Evolution?” and how it explains the myriad of life around us.